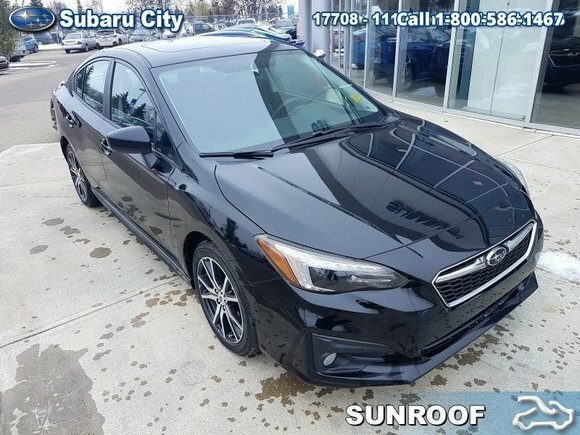 Home > Used Vehicles > 2018 Subaru Impreza 4-dr Sport ATAWD,SUNROOF,HEATED SEATS AND WIPERS, BACK UP CAMERA, BLIND SPOT MIRROR,BLUETOOTH,APPLE/ANDROID CARPLAY!!! 2018 Subaru Impreza 4-dr Sport ATAWD,SUNROOF,HEATED SEATS AND WIPERS, BACK UP CAMERA, BLIND SPOT MIRROR,BLUETOOTH,APPLE/ANDROID CARPLAY!!! Hot Deal! We've marked this unit down $1038 from its regular price of $24888. This 2018 Subaru Impreza is for sale today in Edmonton. The 2018 Subaru Impreza stands out in a very competitive class. That's thanks to its standard all-wheel drive and distinct attitude. It meets or exceeds its competitors at just about everything. Generous tech, a comfortable cabin, and a reliable drivetrain make the Impreza a desirable package. For something a little different in the compact class, check out this Subaru Impreza. This sedan has 21054 kms. It's crystal black silica in colour and is completely accident free based on the CARFAX Report. It has an automatic transmission and is powered by a 2.0L H4 16V GDI DOHC engine. This vehicle has been upgraded with the following features: Sunroof, Bluetooth, Heated Seats, Rear View Camera, Siriusxm. It has some remaining factory warranty for added peace of mind. Want to try the 2018 Subaru Impreza 4-dr Sport ATAWD?